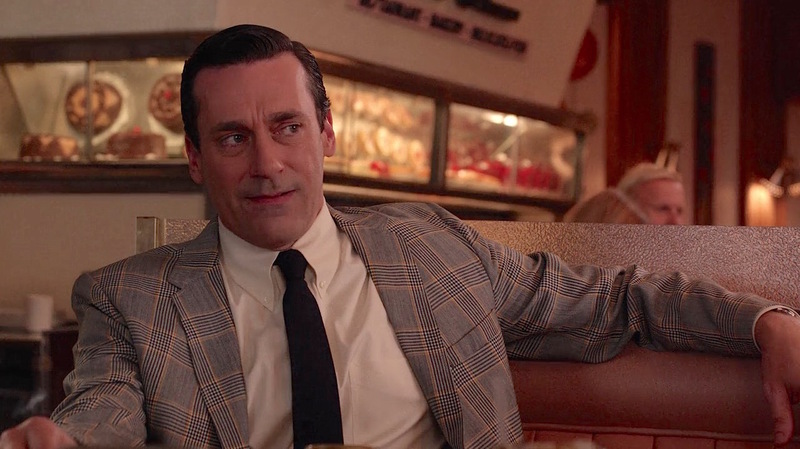 Don Draper, the quintessential “man in the gray flannel suit”, showed his first inkling of sartorial malleability in the trippy “Signal 30” (Episode 5.05) when he reluctantly wore a bold plaid sport jacket gifted to him by his new wife Megan (Jessica Paré) to a business dinner party. 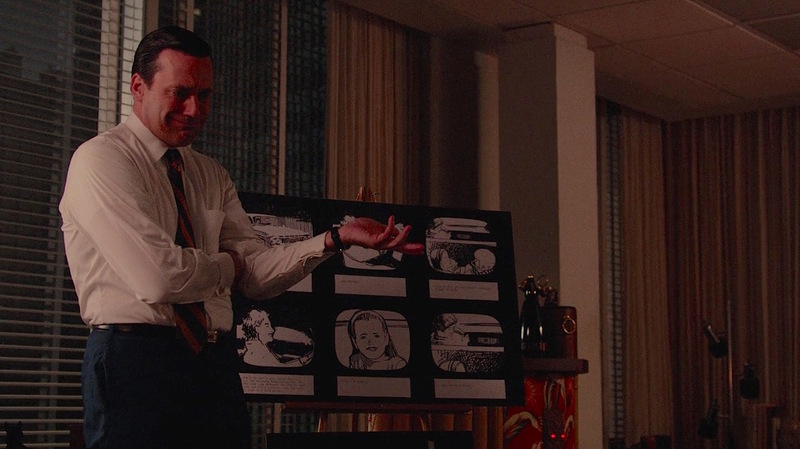 The scene causing a stir among Mad Men audiences surprised to see even Don following the mid-1960s trends being followed by the younger and more fashion-conscious characters Pete Campbell (Vincent Kartheiser) and Ken Cosgrove (Aaron Staton). 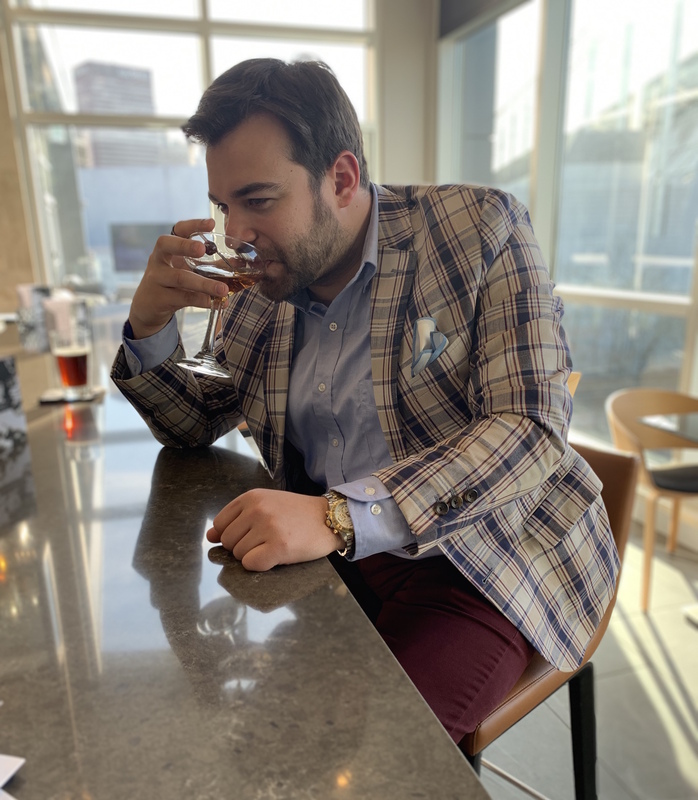 Over the next season as we approach the end of the swingin’ sixties, Don illustrates how this taupe plaid sport jacket is the perfect item for heading straight from work into a weekend getaway, versatile enough for you to do it your way. 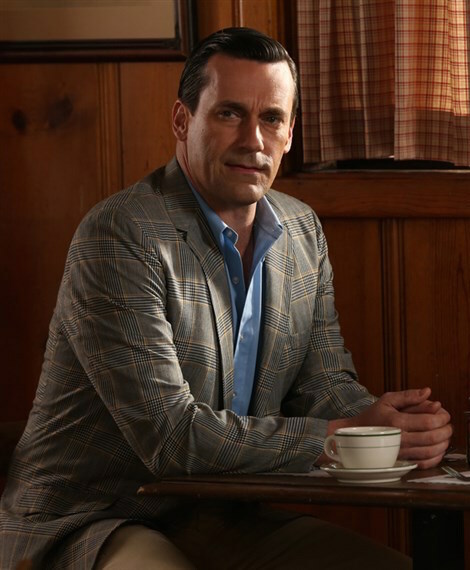 The taupe plaid sports coat is one of Don Draper’s most frequent—and versatile—warm-weather staples in the show’s latter seasons, packed along for business trips, personal getaways, and even weekend forays into the office. The structured sport jacket appears to be made from a cotton shell, a comfortable, cool-wearing, and appropriately casual fabric for a piece that Don only pulls from his closet for informal situations in warmer climates. The bold jacket has a semi-solid taupe ground overlaid with a check consisting of 15 thin stripes—alternating between tan and black—shadowed on each side with an orange stripe. 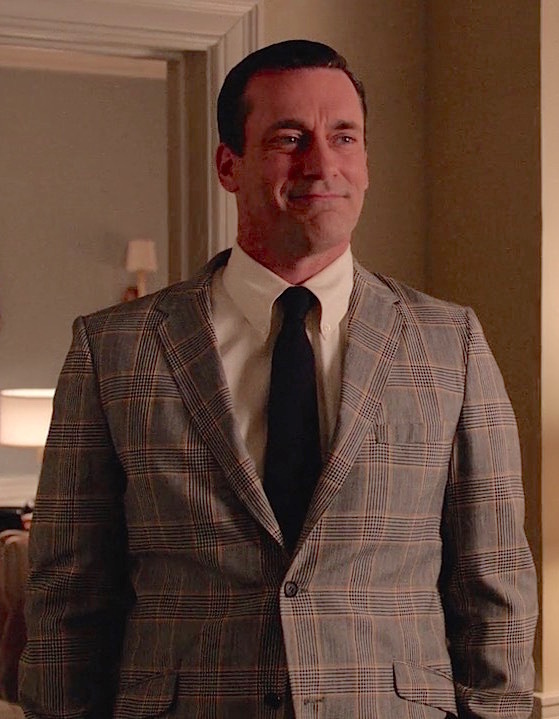 The jacket’s first appearance—”For Immediate Release” (Episode 6.06)—in a scene that would lead to his professional reuniting with Peggy Olson. The plaid single-breasted jacket is cut without front darts in the tradition of the classic American sack coat with a short fit and a high two-button front with the buttoning point well above the natural waist line. The two dark gray plastic buttons on the front are echoed with the spaced two-button cuffs. The sport jacket also has short double vents, gently slanted hip pockets with flaps, and a welted breast pocket that Don wears sans pocket square. 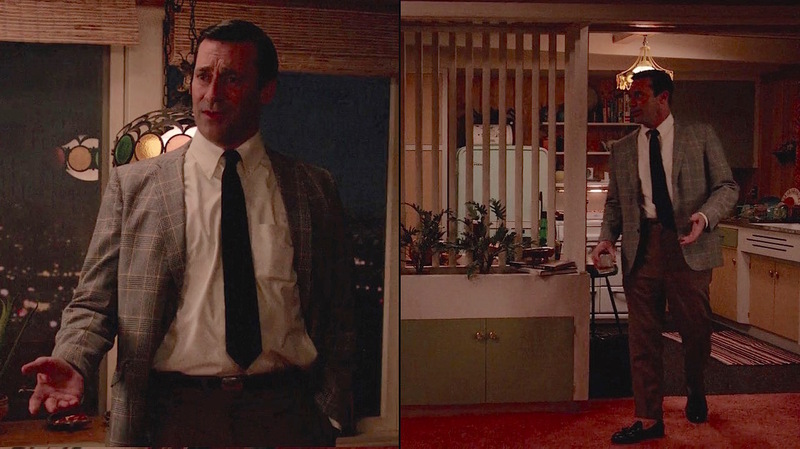 The jacket’s last appearance, one season later in “The Strategy” (Episode 7.06), a scene that would lead to his personal reconciliation with Peggy. Detroit, May 1968. 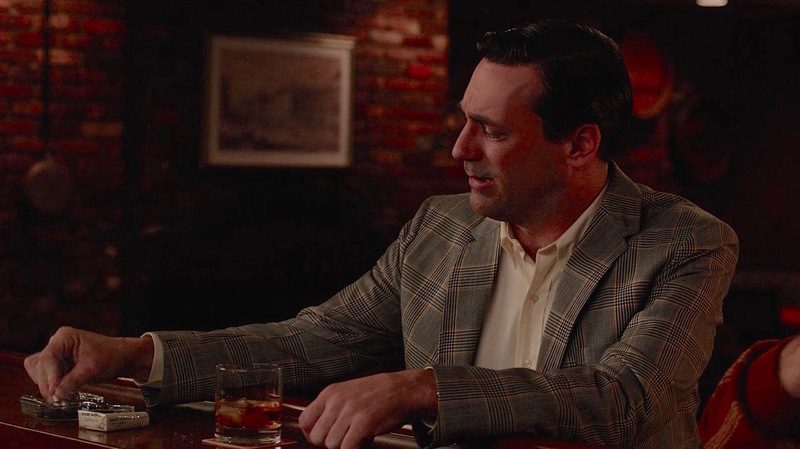 You can picture Don, unable to sleep, pulling on the most comfortable—yet still presentable—shirt that he has, dressing it up just enough with this trusty jacket for its first appearance, and heading down to the hotel bar to chain-smoke his Old Golds and drink the first of who-knows-how-many Old Fashioneds. The well-traveled shirt in question is a yellow cotton button-down shirt, a spring-friendly Ivy favorite. The shirt has a slim button-down collar, breast pocket, and front placket and barrel cuffs that fasten with yellow plastic buttons. Don and Ted begin their night at the hotel bar as muddled as the fruit in their Old Fashioneds. A few drinks later, a plan has been hatched to save both ad men’s careers and agencies. Don wears dark trousers, probably dark brown to remain thematically appropriate. Upstate New York, July 1968. Don has decided to fulfill some of his parental duties by attending his son Bobby’s summer camp, but the situation escalates into something much different when he and his ex-wife Betty (January Jones) find their relations heating up past the family-friendly phase for one last tryst between two unhappily remarried exes. What drew Betty back in? Was it the sight of Don bonding with his middle child while wearing a vintage navy nylon knit polo with a Puritan Ban Lon label? This raglan-sleeve polo is accented with ribbed beige tips accompanied by slim bronze striping on the large collar, sleeves, and widely spaced two-button placket with no button at the neck. Or maybe it was the full effect of his sport jacket worn with the summer-appropriate beige flat-front trousers? Worn with a slim black leather belt that closes through a silver-toned box-type buckle, these beige chinos have straight side pockets, a right-side coin pocket, and back pockets and are finished with plain-hemmed bottoms. Don ignores the “rule” about matching one’s footwear to his belt, instead wearing a pair of dark brown leather tassel loafers with black socks. The shoes are dark enough that the discrepancy isn’t noticeable, and the choice of brown is more harmonious with a summertime casual outfit with khaki chinos. Scenes from summer camp in “The Better Half (Episode 6.09). The next morning, Don and Betty are forced to repress their encounter with the arrival of Betty’s new husband Henry Francis (Christopher Stanley). 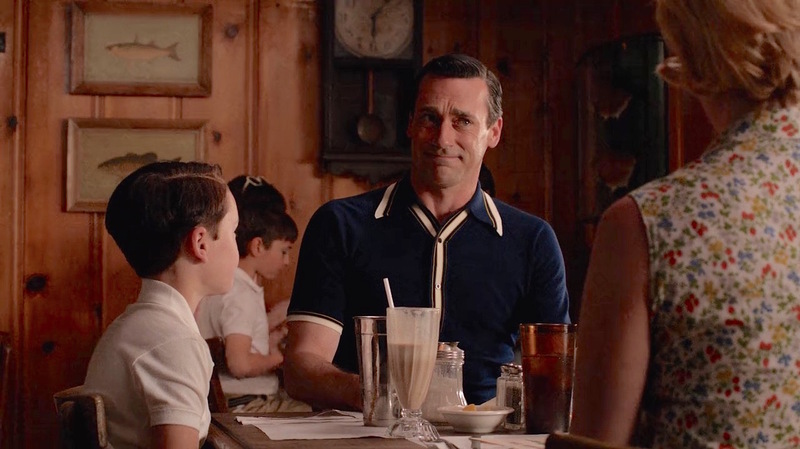 Don, dressed in the same outfit but with a more traditional light blue oxford cloth button-down (OCBD) shirt, is relegated to a lonely booth across the room. The shirt has a large button-down collar and front placket. As we don’t see the cuffs under the jacket, it may be short-sleeved like the polo he wore the previous day. Mad Men? More like Sad Men. Miscellaneous costume note… An oft-discussed red herring from “The Better Half” (Episode 6.09) was the later scene that found Don and Megan arguing on the balcony of their New York penthouse as the ominous sound of sirens punctuated the background. 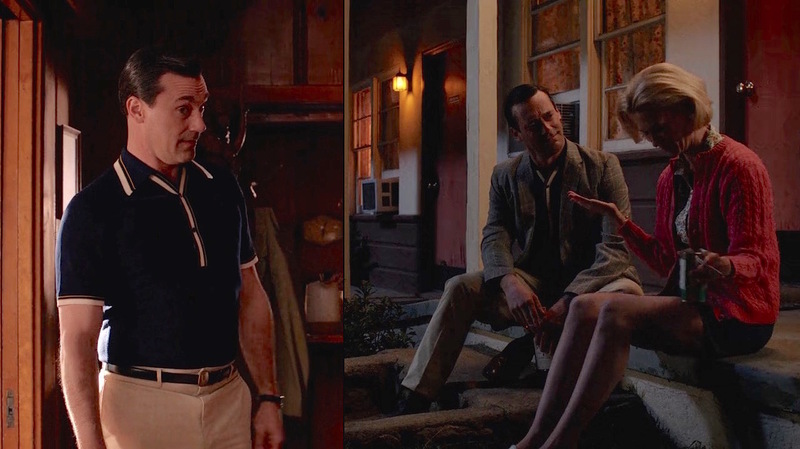 Don was still wearing his taupe plaid sport jacket for the conversation, but it was Megan’s outfit that drew the most attention, wearing a white T-shirt with a bold red five-point star that ignited several unexpected (to me, at least) fan conspiracy theories that Megan Draper was Mad Men‘s stand-in for Sharon Tate, who wore a similar T-shirt in a famous William Helburn photo shoot for Esquire magazine in 1967. A red star T-shirt and ominous sirens in the background… was Megan destined for a violent end? Los Angeles, January 1969. At the start of Mad Men‘s seventh season, we learn that Sterling Cooper & Partners has expanded out to California with its satellite office in the trusty hands of Pete Campbell and Ted Chaough. While out visiting Megan, who has moved to Benedict Canyon (only fueling the Sharon Tate connection theories), Don stops by the famous Canters Deli in L.A. for lunch with an ebullient Pete. Dressed for business despite his unwelcome position with SC&P, Don wears a cream button-down shirt with a solid black tie. The shirt has a larger collar than the yellow shirt he wore half a season earlier when plotting with Ted in Detroit, as well as a front placket, breast pocket, and single-button cuffs. 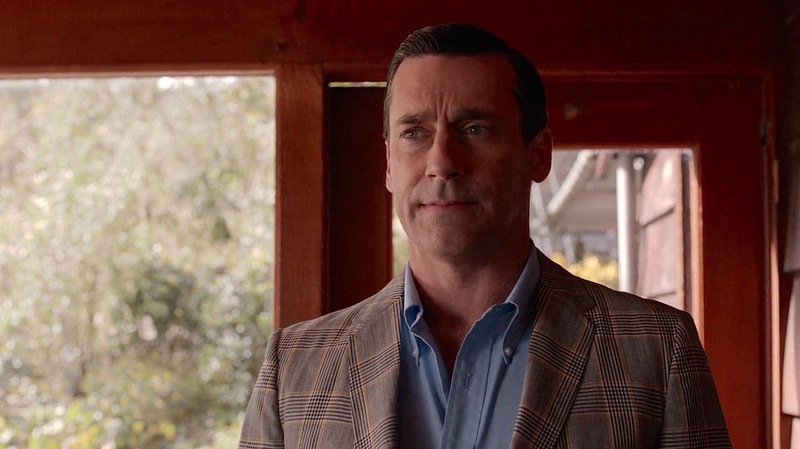 That’s the face anyone would make during an extended conversation with Pete Campbell. Don wears copper brown flat front trousers with belt loops, side pockets, jetted back pockets, and plain-hemmed bottoms. Again, he appears to be wearing a slim black leather belt and dark brown tassel loafers, though Don seems to have embraced a California casual style by wearing low, “no-show” socks with his loafers. Don oversees the delivery of an unwanted TV to Megan’s Lauren Canyon abode. New York City, June 1969. 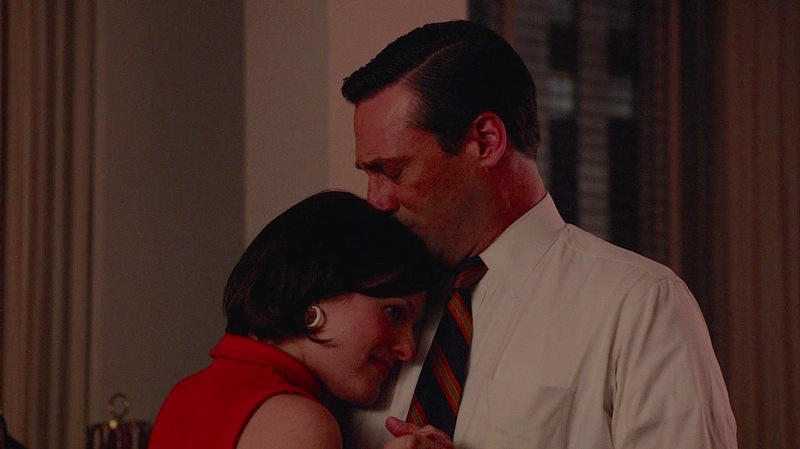 With Chevy no longer an SC&P client, Peggy Olson (Elisabeth Moss) is putting her full effort into securing the Burger Chef account for the agency, though her insecurities create frustrating obstacles. 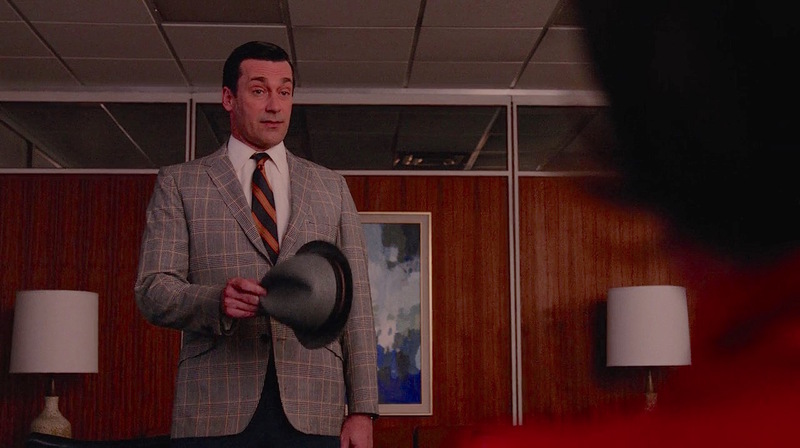 Having been rehired by SC&P a few episodes earlier, Don shows up—hat literally in hand—over the weekend to lend his hand at finessing the pitch and reassuring Peggy of her own talents and abilities, a reconciliation between the two that culminates with a comforting dance to Frank Sinatra’s “My Way” on the radio, an anthem emblematic of the brilliant ad man’s personal ethos. 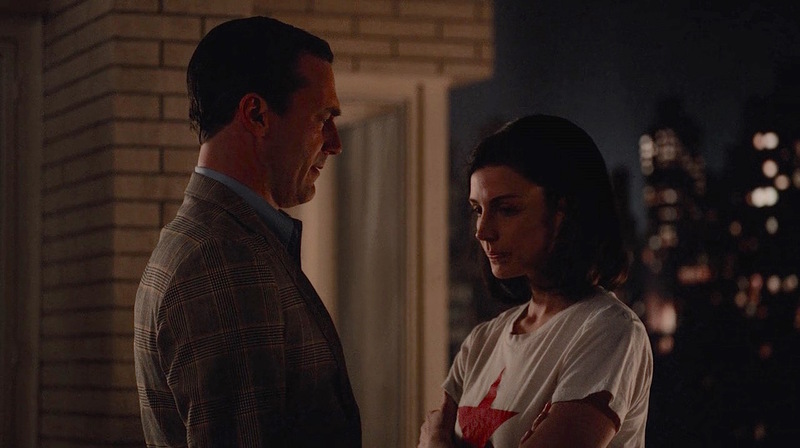 Don and Peggy face the final curtain… or at least the final season. This is the most that Don dresses up the taupe plaid jacket, wearing one of his classic white dress shirts with a semi-spread collar and double (French) cuffs as opposed to the button-down collar, button-cuff shirts he wore with the jacket for earlier appearances. 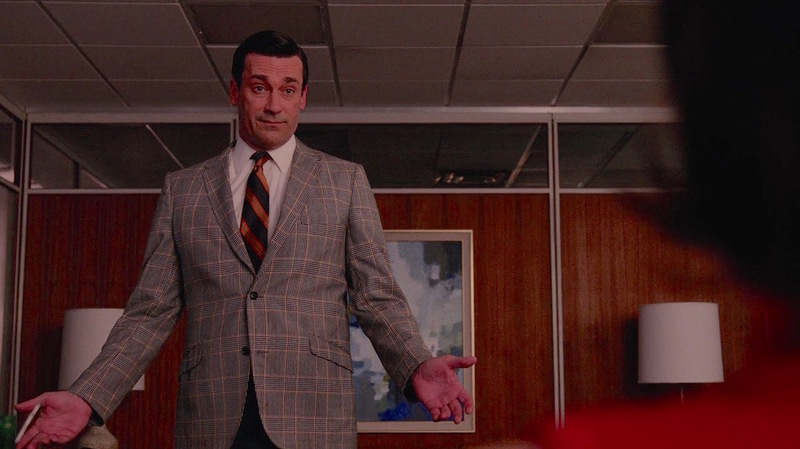 Per usual, the shirt has a front placket and breast pocket for Don’s cigarettes. Don wears a “downhill”-striped navy silk tie with sets of orange-and-gold stripes crossing against the navy ground from the right shoulder-down-to-left hip. Don saves his colorful work wear for the weekends. Don wears dark navy flat front trousers with side pockets, back pockets, and belt loops for his black leather belt with its rectangular brass box-style buckle. Don’s favorite summer hat, a blue-gray short-brimmed trilby made from fine Milanese Pinzano straw, is in his hand when he appears in the office, but—ever aware of social conventions—he isn’t seen wearing it during the all-indoor scene. The hat has a black band with colorful mauve-and-gray stripes. Hat in hand, Don offers Peggy his assistance on the creative strategy for Burger Chef. After a few Jaeger-LeCoultres and a Rolex Explorer across the first half of the show, Don Draper wears a beautiful and classic Omega Seamaster DeVille luxury watch during the latter half from his 40th birthday celebration at the top of season five to his Big Sur retreat at the end of the final season. “‘We’… that’s interesting,” comments Don, the nucleus of a GM-wowing merger forming in his mind. While his choice of timepieces varied over the show, Don’s preferred underthings never deviated from his usual white cotton crew-neck undershirt and matching white boxer shorts with an elastic waistband. Don slips into bed with Megan in “Time Zones” (Episode 7.01). 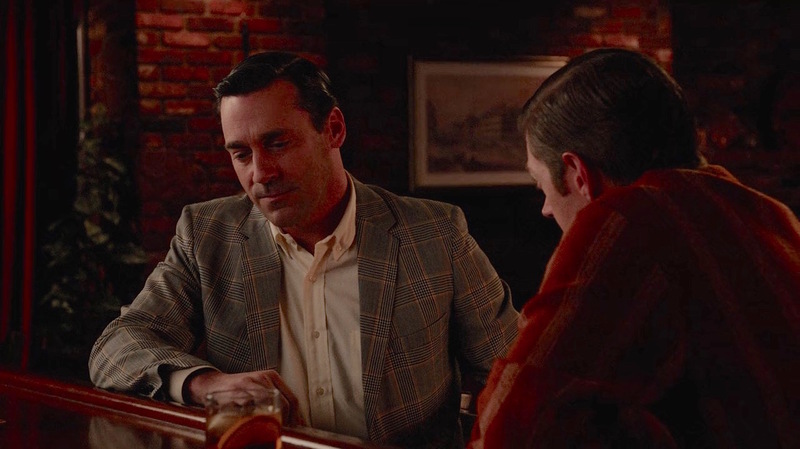 For a dedicated Canadian Club drinker like Don Draper, something about this jacket seems to bring out the Seagram’s fan in him. Don and Betty beat the dry conditions of Bobby’s summer camp when he admits to having located a bottle, pulling a pint of Seagram’s 7 from under his jacket and pouring some into Betty’s can of Fresca while taking pulls straight from the bottle himself. The divorced drinking buddies before one final tryst. The Seagram’s marque is applied to several whiskies. Seagram’s Seven Crown (or Seagram’s 7) is the American blended whiskey, while Seagram’s V.O. is its Canadian whisky cousin. Branded “Canada’s Finest,” the whiskey earned its “V.O.” name as it was supposedly the “very own” blend conceived by Joseph E. Seagram for his son Thomas’s wedding in 1913. 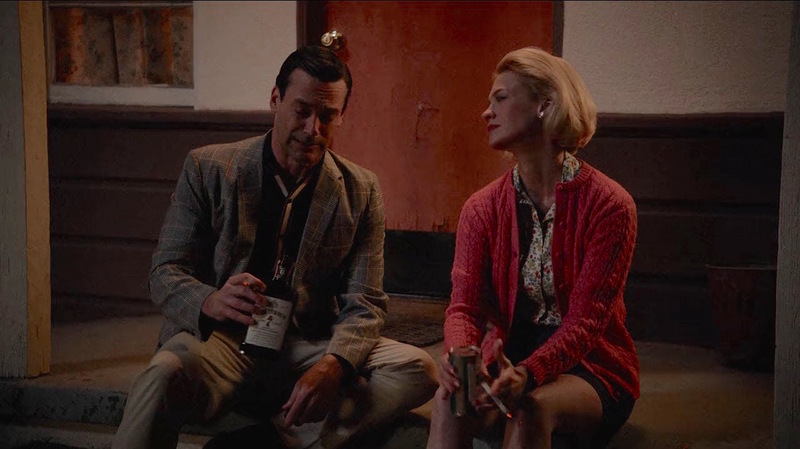 Don and Peggy do plenty of damage to a bottle of Seagram’s V.O. during their weekend strategy session at the office in “The Strategy” (Episode 7.06). 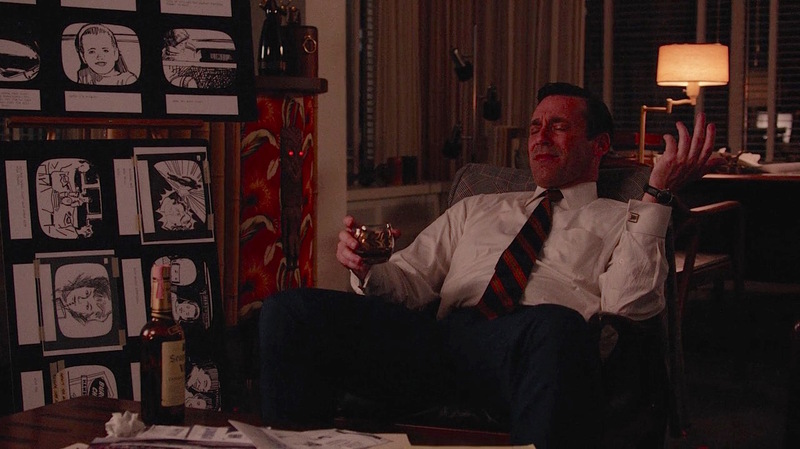 Of course, when Don Draper has his druthers, he’s enjoying an Old Fashioned, and not just one of them. 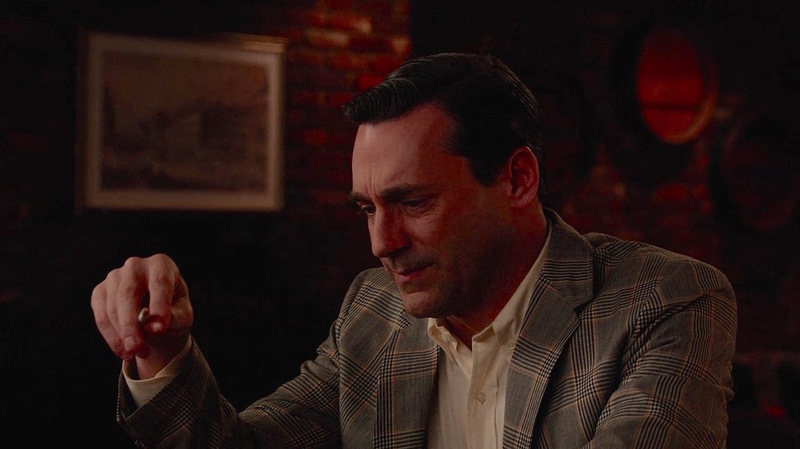 “For Immediate Release” (Episode 6.06) finds him spending a sleepless night at the hotel bar in Detroit, the telltale muddled fruit giving away the whiskey cocktail in front of him. 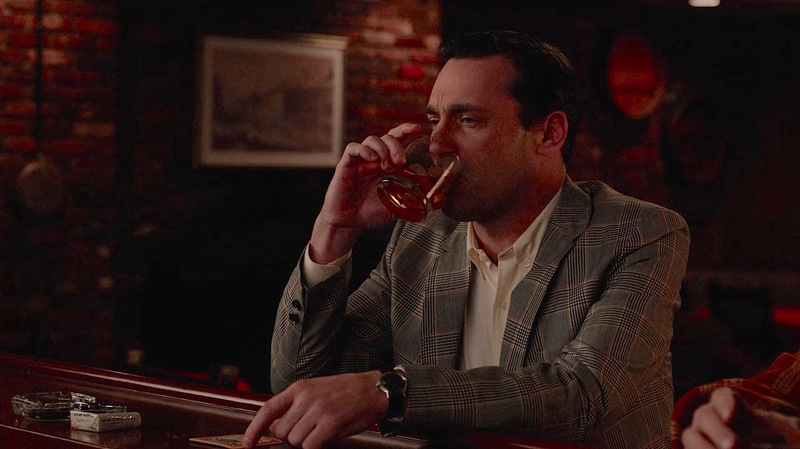 A familiar image: Don Draper with an Old Fashioned and a pack of cigarettes, though he’s switched from his Luckies of earlier seasons to Old Golds after Lucky Strike left his agency at the end of the fourth season. 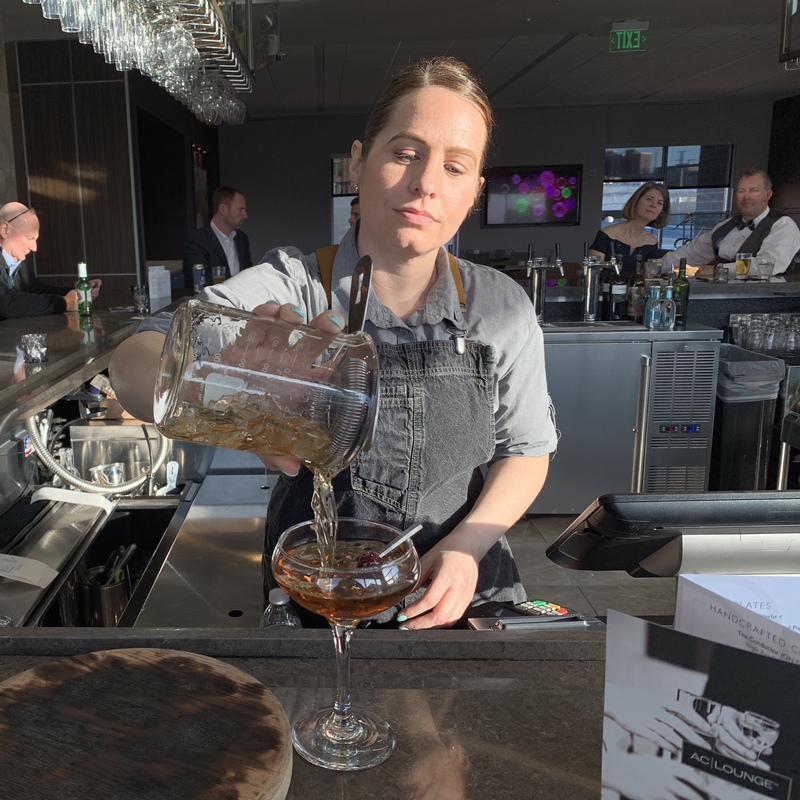 The drink in question was expertly mixed by the bartender, Mel, with a smoky finish that’s tastier—and arguably healthier—than the vapors of Don Draper’s Old Golds. As vermouth can make or break a Manhattan, the choice of Lustau—a botanical sherry-based Spanish vermouth—added a welcome complexity to the drink, though the highlight of the order is arguably the smoking process. Mel fired a blow torch onto an inch-wide oak plank for approximately ten seconds then placed a clean coupe glass atop the flaming wood, simultaneously extinguishing the flame and infusing the inside of the glass with smoke. After mixing the Maker’s Mark, Vermut Lustau, and bitters over ice, she strained the concoction into the smoke-infused glass and the delicious drink was complete. The finished product: a delicious Smoked Manhattan (sans a few heavy sips from yours truly!) next to the well-torched oak plank that helps add the cocktail’s distinctive flavor. 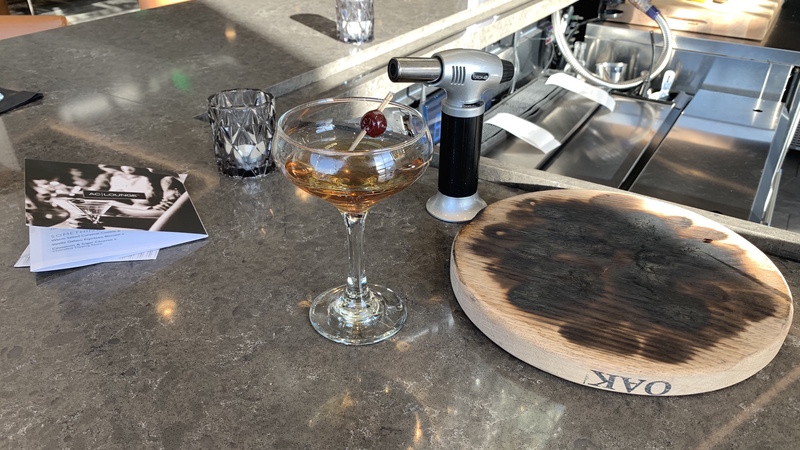 Whether you’re a local yinzer or a tourist in the City of Champions, I recommend checking out Level 7…and especially ordering the Smoked Manhattan! Consider the context: are you looking for something to wear for a warm day at the office or dressing up your style for a summer weekend? Either way, grabbing a jacket like this is a fine place to start! Dress it up à la Don Draper with a white French-cuff shirt and complementary striped tie…or dress it down with a dark knit polo with complementary accent colors! 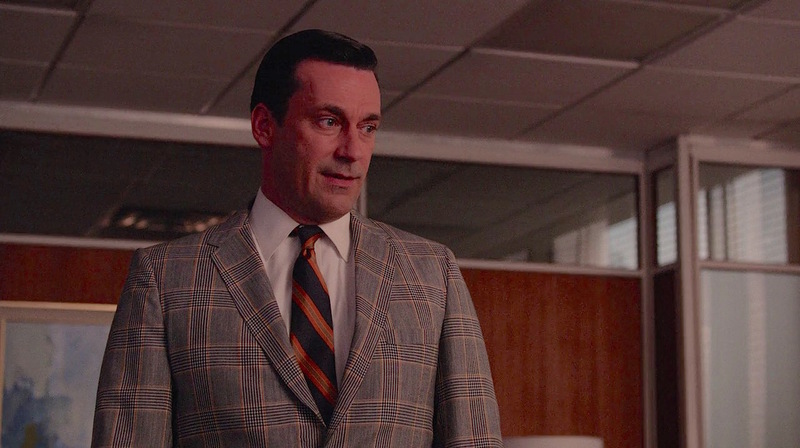 Don Draper shows the versatility of a colorful plaid sport jacket across the show’s final seasons. The future is something you haven’t even thought of yet. Is that what is called “glen plaid” or “Prince Of Whales” check ?